FA: George Ridgley, Bryan Law, Sabine Schirm, August 2005. Fun climbing with a stellar crux section on the second pitch. Sections of easy climbing mixed with fairly well-protected (but not tightly bolted) knob and small shelf (or ripple.) climbing, plus runout easy slab. 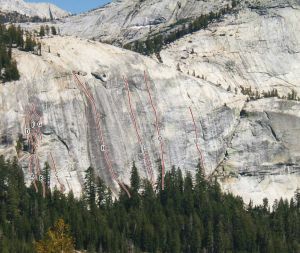 A huge boulder with a killer flat-topped hang-out marks the start of the route. You need two 60m ropes to rap, or you can walk off after a pitch of 4th class up and right. Which SuperTopo guidebooks include a topo for Ripple?